We have new volunteering opportunities opening up soon (we applied with an European Solidarity Corps partnership project and the funding decision will be confirmed by the end of December), and with these we could also host Bulgarian volunteer(s) in a more flexible way. All our vacanies are still in youth centres, this means daily contact and communication with young people and youth workers and chances to take initiative and contribute with different skills. In case the funding will be provided, there will be a youth centre in Tartu looking for a volunteer who could start in January 2019 and stay for 12 months. If you have suitable applicants for this period, you may already send CV's and motivation letters to me, since we predict positive answer from the National Agency concerning our project and are starting to prepare for the new year. We'll start planning the next volutneering services for September 2019- June/August 2020 in March-April, so this might also be an opportunity. Единственото условие е да си под 30 годишна възраст. Да помагаш на посрещащата организация да организира извън класни дейности за младежи: кръжоци, работилници, спортни събития, летни лагери и други. Saku Valla Noortekeskus е неправителствена организация, която се занимава с обществено полезна дейност (тоест тя е некомерсиална организация). Ако желаеш да кандидатстваш, моля те да ни пишеш на email или facebook (Може да ги видиш в бутон "За връзка"). Saku Municipality Youth Center is administred by Saku Municipality. We have two youth centres in Saku area: situated in Saku and Kiisa. Youthcenter provides different kinds of opportunities to local youth at ages 7 - 26. Saku Municipality Youth Center has two different houses, bigger one is located in Saku and smaller one in Kiisa. Kiisa youth centre will get bigger and new rooms in september 2015. Both centers are popular among young people. Youth Center is mainly opened from Monday to Friday and offers different kind of activities and hobbyclubs for youth. Youth Centre aim is to organize and coordinate youth work in Saku municipality area. playing billiard, table tennis, board games, TV games, listen music, use the kitcen etc. There is also computers, where young people can surf in the Internet, study or play computer games. 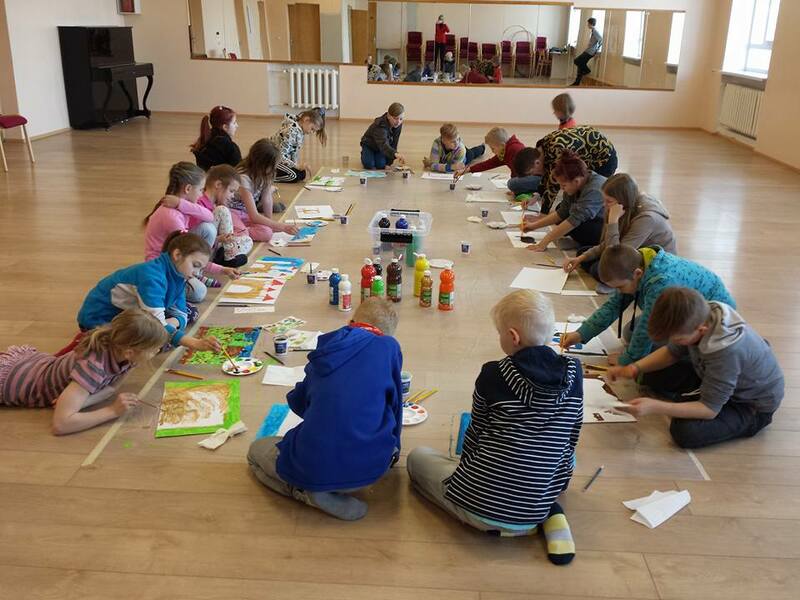 Each day about 40 – 60 young people are visiting Youth Center in Saku. Kiisa Youth Centre rooms are very small at the moment. From september 2015 Kiisa centre will get bigger rooms, where youth will have equal possibilities with Saku centre. Youngsters in Kiisa are full of energy , they like to travel around Estonia or even in the world. We have token part several youth exchanges and training courses. Each day about 5– 20 young people are visiting youthcenter in Kiisa. In Saku Municipality Youthcenter works 3 youthworkers with full time and 1 manager with full time. People are divided between two youthcenters in Saku and Kiisa. During the school brakes and summer we are organizeing different type of youth camps. For smaller kids 7 - 9 years we have day camps, five days in week. For older youth 10 - 12 years we have 4-5nights camp together with, our friendship municipality Ylojärvi, youth from Finland every year. One year in Estonia and one year in Finland. Youth between 13 - 17 will participate in work camps where they can get their first payments and work experiences. Youth from 13 - 26 year also participate in different international projects. Saku Municipality youth center is making teamwork with other Saku organisations, mostly with schools. We are visiting schools and making activities for kids between the lessons. Also we lead some art lessons, to bring different activities to everyday work. We learn from teachers and they learn from us. Because Saku is not that big it is good to make collabration with different youth organisations and teamwork with local Municipality is very good. All activities are carried out together with other youth center workers. Hosting an EVS volunteer is a mutually enriching undertaking and useful for all people involved (directly or indirectly) in the project. We believe that the EVS Service in the Saku Municipality Youth center would give the young volunteer a good possibility to get an international experience of other cultures, countries, ways-of-life and specific know-hows which will be useful for his/her personal growth and professional activities. Working with and for youngsters and/or children the volunteer will easily feel and see the benefits and results of his/her work and activities, giving him a good feeling about oneself. The direct involvement in the social field will also make the volunteer get to know the advantages and disadvantages of this field of life, making him/her understand if this could be something to be closer involved in later in life. Besides, we consider very important that the young person would reflect about the need and usefulness of voluntary work and we hope that this will make the youngster socially more conscious and responsible, encouraging him/her to be an active and caring citizen. Last but not least, the aspect of intercultural and international experience is of great importance. The volunteer will have the possibility to live abroad, surrounded by a different cultures, nations, persons and languages. Everything will be new for the volunteer and this will make him/her to be flexible and tolerant and find ways to get adapted in new environments and settings. This makes the EVS Service valuable for each young person. The EVS volunteer hosted in the Saku Municipality Youth center will be involved in various activities of different local institutions working with youth and/or children. Depending on the interests and abilities of the person, the volunteer can be involved in the activities and everyday work of such local institutions as the culture and youth centers and clubs, kindergartens, grammar school, art school, school for children with learning difficulties. for long-term EVS to different youth centres across Estonia. summer holidays start, that means by the end of June. More info about the hosting youth centres can be provided, too. AEYC is coordinating volunteers to different Estonian youth centres. Open youth centres provide educational leisure time activities for young people aged 7-26. They permit equal access and opportunities, support for young people and their ideas, space for socializing and equipotential partnership. The volunteers are expected to assist local youth workers in daily tasks, contribute to the activities of the youth centre and initiate new ones, communicate and collaborate with different partners in the youth centre and community, act as role models for youngsters. - Opportunity to contribute to the development of young people as well as international youth work in Estonian youth centres. Each youth centre will normally host 1 volunteer. Food and pocket money will be transferred to volunteers' bank accounts monthly. Accommodation, mentor and Estonian language course (minimum of 20 hours) will be provided close to the work place free of charge. Volunteer will work in a team of local youth workers. International travel costs will be reimbursed within Erasmus+ budget limit. Work related transportation costs will be covered. Volunteer will participate in on-arrival and mid-term training organized by Estonian National Agency. Work related training and guidance will be performed by tutor in the youth centres. Volunteer will participate in Estonian language course, additionally free online language learning tools will be provided. During the service, the volunteer will have possibilities to meet other international volunteers coordinated by the organisation and participate in common gatherings and evaluation sessions. We will host volunteers from Erasmus+ programme countries!